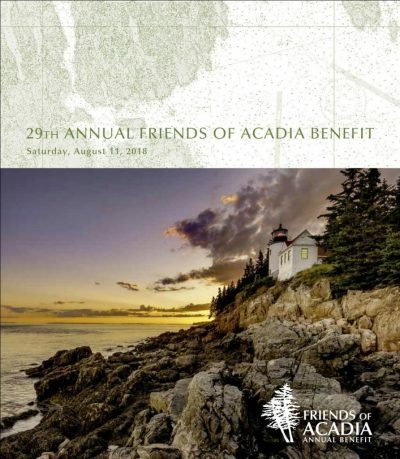 BAR HARBOR — Friends of Acadia has released the catalog for its 29th Annual Benefit Auction and it contains donations of travel and adventure packages, home décor items, jewelry, outdoor equipment, and works of art from scores of Maine’s foremost artists. Live items include Caribbean and French Wine Country vacations, Ski trips, A 1973 Austin Mini, boat trips on local historic yachts, cocktails with Martha Stewart, and a celebrity chef dinner at an exclusive Manhattan address. Silent auction items include another in a series of hand-hooked rugs by Rosemary Levin featuring Acadia National Park’s carriage road bridges, paintings, photographs, quilts, Red Sox tickets, pottery, guided trips and even retired Acadia trail signs. Although the Auction is set for Saturday, Aug. 11, under the big tent on the grounds of the Asticou Inn in Northeast Harbor, absentee bids can be left in advance via a form on the FOA website. Potential buyers do not have to be registered to attend the benefit in order to make a bid. To view or download the full catalog, click here. The Catalog Addendum 2018 is available as well. To place a bid, visit the absentee bid page. For more information about the Benefit Auction contact Shawn Keeley at shawn@friendsofacadia.org or call 207-288-3340.